Henry C. Gardiner left this life on Wednesday, January 21, 2015 at 7:01 a.m. in Ashland, Kan., with his family by his side. The Henry Clay Gardiner family homesteaded in Clark County, Kan., arriving on their claim March 13, 1885. Ralph Gardiner, Henry's father, was born in a sod dugout southwest of Ashland in 1889. The family lost their original homestead of 160 acres in 1894. In the depression years of the 1930s, the family again lost the majority (2,000 acres) of the ranch. This happened when the family could not make payment for the land after a wheat crop was hailed out just prior to foreclosure. Each time the family was challenged, it regrouped to start again. Ralph Gardiner did not marry until he was 41 years of age when he met a school teacher, Muriel Small. Muriel had moved to Englewood, Kan., as a young girl. To this union, two children were born, Henry C. Gardiner and Helen Mae Gardiner. Henry was born on September 14, 1931 in Ashland. He grew up on his parent's farm where one of his earliest achievements was learning how to milk the family cow. Soon after, it also became his job to gather eggs and feed hogs. Henry often told about those chores and remembered that he did not enjoy them much. At age nine, he began to drive his dad's Caterpillar tractor, pulling a 24-foot combine during the summer harvest of 1941. Henry often noted that the tractor would start running 30 minutes later than he thought it should—while he milked the cows. He also reminded everyone that after he became the boss "we no longer milked cows". Henry graduated from Ashland High School in 1949. With an early dislike of even small town dairying, Henry turned to raising beef as soon as he could. In January of 1947, he showed a home-raised Angus steer as the reserve champion Angus steer at the National Western Stock Show in Denver. That steer was about 13 months of age and weighed 915 pounds. The steer was brought home and shown again the following September at the Kansas State Fair, earning grand champion honors. By state fair time, the steer weighed 1,100 pounds and sold for $1 per pound. One of the prizes for the champion steer was a $100 credit from the Kansas Angus Association to be applied towards the purchase of a registered Angus heifer. Henry purchased two Angus heifers. This was the beginning of Gardiner Angus Ranch's entry into the genetics business. Nan Arnold came to Ashland in 1955 to teach vocal music to grades 1-8. She also gave private piano lessons to any children whose parents wanted them to learn piano. This gave her 24 beginning "plink plunkers" the first year she taught. As part of her teacher's job, Nan sold school lunch tickets each Monday morning for the week. Her teacher's salary was $3,200. Nan recalls when she interviewed for the Ashland job, "Prof" Humphreys asked her if she was a "good girl". She obviously gave an acceptable answer. A mutual friend, Pauline Baker, introduced Nan and Henry in Ashcraft's Drug Store. Henry did not know it then, but he had been caught by that "pretty red head". Mary Nan Arnold and Henry Gardiner were married May 29, 1957. To this nearly 58-year marriage, three sons, Greg Arnold Gardiner, Mark Ralph Gardiner, and Garth Henry Gardiner, were born. Henry is survived by his loving wife Nan; Greg and Debbie (Dreiski) Gardiner and their children Grant, Brittany, and Sierra; Mark and Eva (Stumpff) Gardiner and their sons Ransom, Cole, and Quanah; and Garth and Amanda (Maxwell) Gardiner and their children Greysen, Gage and Grace. He is also survived by his sister Helen Arnold. All of the family resides near Ashland. Gardiner Angus Ranch, started by Ralph and enhanced by Henry, is currently operated by the fourth and fifth generations of the Gardiner family. Cattle have been the principal business of the Gardiner family since the ranch's inception in 1885. Henry graduated from Kansas State University in 1953 with a Bachelor of Science degree in Animal Husbandry. While attending Kansas State, Henry learned the basic principles of animal breeding and selection, including how to artificially inseminate (AI) cattle. At the time, AI was a new technology. Early adoption of emerging technologies became a lifelong pattern and a way of life for Henry. His vision and courage shaped the future of Gardiner Angus Ranch. That lifelong passion included a determination to make the beef industry better for commercial cattlemen and consumers. Henry's passion was marked by a diligence and dedication to the industry that is seldom seen in any business. Following graduation from K-State, Henry was drafted into the United States Army and spent the next several years stationed in Augusta, Ga., and overseas in Germany where he served as a radio repairman. He specifically enjoyed his leave days when he could venture out and look at Angus cattle. Henry incorporated techniques to maximize genetic improvement of the herd, including AI, as a standard ranch practice in the mid 1950s. AI became the only method of breeding cows beginning in 1964. No clean-up bulls have been used to breed cows at Gardiner Angus Ranch since that time. Even though he was using the so-called "best bulls of the Angus breed" for sire selection, from 1964 to 1980 the average weaning weight of steer calves on the ranch improved very little. All that changed in the fall of 1980, when the first Sire Evaluation Report of the American Angus Association was published. Henry was one of the very first to realize that accurate estimated breeding values (EPDs) determined by the American Angus Association were the key to genetic improvement. From that day forward, he dictated that the Gardiner Angus Ranch breeding program would be based on a total AI breeding program using only proven Angus sires with high accuracy EPDs. This simple, yet effective use of the best breeding information in the industry, allowed the ranch to thrive for the past 35 years. Gardiner Angus Ranch grew from a break-even business selling 52 bulls in 1980, to the second largest purebred Angus herd in America, selling over 2,300 bulls and 1,000 females annually. Henry offered Gardiner Angus Ranch as a cooperative research facility to many universities. Cooperative research has been conducted on the ranch by scientists from Kansas State University, Auburn, Colorado State, University Of Illinois, Oklahoma State and Virginia Tech. Research performed on the ranch has ranged from measuring the serving capacity of bulls (libido) to refining estrus synchronization, AI and embryo transfer systems for beef cattle. In 1987, Gardiner Angus Ranch began using embryo transfer (ET) to enhance the genetic improvement program. In the beginning, the use of ET was modest. Today, nearly 3,000 embryos are transferred to recipient cows on the home ranch or in cooperator recipient herds located in Australia, Florida, Iowa, Illinois, Kansas, Missouri, Minnesota, Georgia, Texas and Virginia. 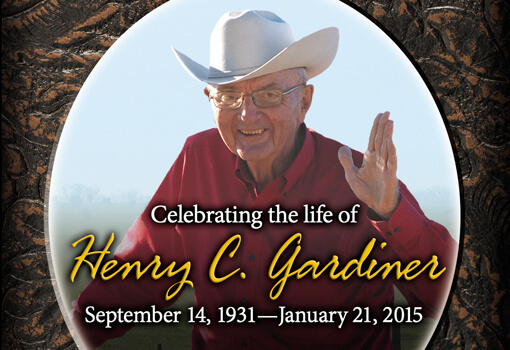 Under Henry's guidance, in 1996, Gardiner Angus Ranch became a founding member of U.S. Premium Beef (USPB), a producer-owned cooperative that secured controlling interest in the fourth-largest beef packing company and installed a value-based marketing program that has returned over $325 million in premiums to its members. USPB embodies Henry's belief that the future success of the beef industry depends on a true value-based marketing system that rewards quality, instead of the "one price fits all" commodity system that had plagued the beef industry for decades. The success of USPB accelerated the movement of the entire beef industry towards value-based pricing systems. Henry was an industry leader and was awarded many accolades from his industry peers. A few of his industry accomplishments include Beef Improvement Federation (BIF) Outstanding Commercial Producer of the Year (1981), Outstanding Seedstock Producer of the Year (1987) and Pioneer Award (1997). He is the only person in BIF history to be honored for both commercial and seedstock awards; Kansas State University Stockman of the Year (1990); National Cattlemen's Foundation Cattle Business of the Century Award (1998), Beef Industry Vision Award (2004); Kansas Farm Bureau Distinguished Service to Agriculture Award (2002); Founding member, U.S. Premium Beef; Certified Angus Beef Commitment to Excellence Award (2004); Kansas State University Livestock and Meat Industry Council, founder and board member; American Angus Association Board of Directors (1977-1983); Livestock Publications Council Headliner Award (2004); Kansas Cowboy Hall of Fame; and Kansas Angus Association Honorary Member (2002). In 2007, Henry and Nan were inducted into the National Junior Angus Association Honorary Foundation. In 2008, Henry was the Record Stockman "Man of the Year". He has written numerous papers and presented talks in 35 states and three foreign countries. Gardiner Angus Ranch has hosted producers and tour groups from nearly every state in the union and many countries around the world. Henry never met a fellow beef producer that he wouldn't spend countless hours helping. Henry has instilled in his family the will to achieve their goals. He has challenged and encouraged an entire industry to improve beef products that consumers demand. Henry was quick to adopt new technology and attempted to educate others how they could do the same to improve their profitability. However, Henry's greatest achievement has been his vision for the Gardiner family. He was a father, a mentor, a friend, and a boss. He has mandated that we stand united as a family and a business. He grew the business to support nine families. He left a legacy to improve on the land, the cattle, the industry, but most importantly to pass on the ability to love the family and the industry the way he had done throughout his life. Henry gave us all the example of a life well lived, giving the best he had every day. An accurate description of Henry would not be complete without a tribute to his character. He was a man shaped by his environment, yet everyone around him was influenced by his strong perseverance and determination. He was a rugged man who believed in the land and sunk his roots deep into it. His capacity for work was legendary. This capacity was not achieved so much from great physical strength, but from a mental determination. He responded to many a challenge in life with the attitude that "We can do this! So let's get to doing!" He had a love and compassion for his fellow man that was unique. He had a passionate love for Ashland and the history of the Great Plains. He loved the land, the cattle, and the people of Clark County, the United States and the world. He loved his family even more. Henry once said, "When in the life's cycle does a wheat plant die?" He would tell us that, "It does not die but merely changes form. It changes from a single green shoot to a vigorously stooled, many leaved plant, to a tall, slender, many headed, golden grained, mature plant. However, that is not the end, for there is still life in this plant that lives on for generations." Henry lives on in his children and his nine grandchildren whom he adored. His personification has changed form, yet his influence on earth will be felt for many generations. Personification on his faith will occur each year as calves are born and colts run and play. As Henry commences his journey to meet our Lord and Savior in heaven, a friend of the family reminded us of a verse from Psalm 50:10: "The cattle are upon a thousand hills." He quickly added, "We don't know if all of those cattle are Angus, but they are fixing to be!"